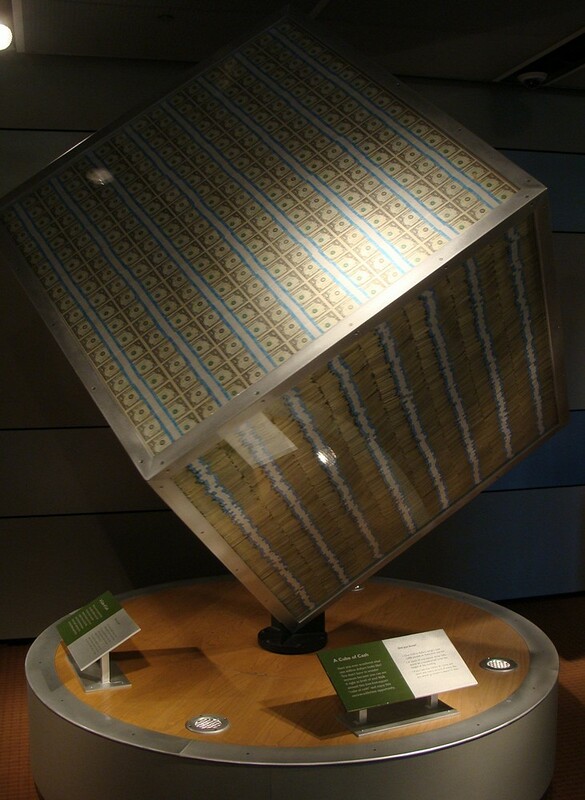 Here is a photo of a display from the Money Museum at the Federal Reserve Bank of Chicago with a million dollars in one dollar bills. The size is not immediately apparent from the photo, so let’s work it out. Dollar bills measure 2.61 inches wide by 6.14 inches long, and 0.0043 inches thick. Laying bills side by side gives you a square 8 bills X 19 bills (totaling $152.00 in one dollar bills) to total around 50 inches by just under 50 inches. (If stacked on top of each other in a single pile, it would be around 330 feet tall). What would it take to make a stack nearly the same height as the 50″ square we started with? 1,000,000 bils divided by $152 per layer = ~$6,579 per stack so multiply by 0.0043 to get (hmmm – a 28 inch high stack of bills) – so the thickness must be skewed by wrinkled and creased bills nearly 1.78 times that .oo43 thickness. Also there’s the thickness of the wrapper bands to account for. So there you have it – around 4 feet square (or so). You can see it for yourself next time you are in Chicago. Directions: The Money Museum at the Federal Reserve Bank of Chicago. A video on the “Virtual Money Museum” tells us it would require spending one dollar a second for twelve days straight to spend the $1,000,000 dollars. You’d be really tired of spending money at that pace after just a few hours. The weight of a million one dollar bills is over 2,000 pounds – that’s a ton of money – better to get 10,000 hundred dollar bills, which would cut the size down to a large briefcase or backpack and weigh in at around 20 pounds.